The sitter's second wife, Katherine Boyer Coolidge [1755-1829], Boston; her step-granddaughter, Catherine Boyer Coolidge Pomeroy [Mrs. Samuel Wyllys Pomeroy, 1808-1861], Cincinnati, Ohio; deposited with her sister, Hetty Coolidge Haight [Mrs. Benjamin Isaacs Haight, 1812-1905], New York, for her daughter, Clarissa Alsop Pomeroy [1847-1924]; to Clarissa A. Pomeroy's niece, Margaret Burnet "Greta" Pomeroy Clark [Mrs. Phillips Allen Clark, 1866-1938], New York; sold January 1918 to (M. Knoedler & Co., New York); sold 31 January 1918 to Thomas B. Clarke [1848-1931], New York; his estate; sold as part of the Clarke collection on 29 January 1936, through (M. Knoedler & Co., New York), to The A.W. Mellon Educational and Charitable Trust, Pittsburgh; gift 1940 to NGA. On the Coolidge and Pomeroy families see: Genealogy of Some of the Descendants of John Coolidge of Watertown, Mass., Boston, 1900; Albert A. Pomeroy, History and Genealogy of the Pomeroy Family, Toledo, Ohio, 1912: 513; Emma Downing Coolidge, Descendants of John and Mary Coolidge of Watertown, Massachusetts, Boston, 1930: 354, 355; and AmericanPomeroys.org, Pomeroy Family Tree, accessed 28 July 2016. Information in these sources has been supplemented by the research of Marcia Haight Erickson and her husband. Mrs. Erickson is the great-great-granddaughter of Hetty Coolidge Haight, and she kindly shared her and her husband's findings in e-mails of 19 and 25 February 2008, in NGA curatorial files. The provenance of the painting as it was published in the 1995 NGA systematic catalogue has been adjusted here to reflect the new information. Greta Pomeroy Clark was the daughter of Lt. Col. Charles Pomeroy (1833-1898), who was Catherine Boyer Coolidge Pomeroy's son and therefore brother of Clarissa Alsop Pomeroy. Letter of 7 July 1992 from Melissa De Medeiros, librarian, M. Knoedler & Co., to Dr. Ellen Miles (NGA curatorial files). The name of the seller and the date of purchase are recorded in a copy of Portraits by Early American Painters of the Seventeenth, Eighteenth and Nineteenth Centuries (Exh. cat., Philadelphia Museum of Art, 1928) annotated with information from files of M. Knoedler & Co., NY (copy in NGA curatorial files and in NGA library). Western Art Union, Cincinnati, 1849, no. 77. Portraits Painted in the United States by Early American Artists, The Union League Club, New York, February 1922, no. 3. 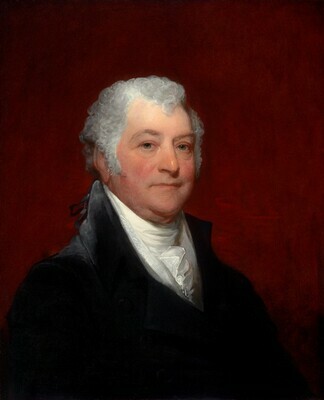 Mason, George C. The Life and Works of Gilbert Stuart. New York, 1879: 162. Park 1926, 237-238, no. 187, repro. Salisbury, William. "The Clarke Collection of Paintings." The Antiquarian 12, no. 5 (June): 47, repro. Preliminary Catalogue of Paintings and Sculpture. National Gallery of Art, Washington, 1941: 188, no. 489. Book of Illustrations. National Gallery of Art, Washington, 1942: 249, repro. 8. Paintings and Sculpture from the Mellon Collection. National Gallery of Art, Washington, 1949 (reprinted 1953 and 1958): 142, repro. American Paintings: An Illustrated Catalogue. National Gallery of Art, Washington, 1980: 229, repro. American Paintings: An Illustrated Catalogue. National Gallery of Art, Washington, 1992: 357, repro. Miles, Ellen G. American Paintings of the Eighteenth Century. The Collections of the National Gallery of Art Systematic Catalogue. Washington, D.C., 1995: 263-265, repro. 264.